The Cape sits at the meeting place of the Atlantic and Indian Oceans, and over 3,000 sea animals from both oceans are showcased in the aquarium, highlighting the diversity of marine life found in the waters around Cape Town. 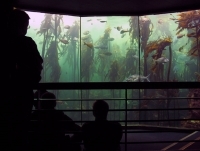 The Two Oceans Aquarium is one of the city's top attractions and visitors of all ages will be interested in the variety of exhibits, such as the Predator Exhibit, featuring large sharks and rays, the mesmerising Kelp Forest Exhibit, and animals such as seals, penguins and turtles, among thousands of different fish. It is also possible embark on dives in specific tanks. Advanced booking is required, divers must present dive qualifications, and the privilege does carry an additional charge. The Shoreline Cafe at the Aquarium boasts lovely views of Table Mountain and the harbour and has a children's play area, making it an ideal place to have refreshments. However, visitors are spoilt for choice because the aquarium is located at the famous V & A Waterfront, crammed full of great restaurants. It is special to be able to stroll along the harbour after visiting the aquarium, and boat trips out into the open ocean can be arranged from the harbour. Admission: R160 (adults), R115 (children 14-17), R75 (children 4-13). Tickets valid for the day.